The following blog post was written by Andrew Robertson of Microsoft UK. I work very closely with Leigh Wolmarans, and when Microsoft heard about the great things Leigh is doing with Minecraft they wanted to find out more. Andrew contacted myself and Leigh and arranged a telephone interview to find out about how Lings Primary are using Minecraft, and what was involved during the setup process. Below is the final outcome. And as a self-confessed gamer, it wasn’t a huge leap of imagination for Lings Primary School Headteacher Leigh Wolmarans to see the potential impact that Minecraft could have when blended with the academic curriculum. But before we get into the detail of what the students are achieving through Minecraft, it’s important to understand a little bit about the recent history of the school, and the socio-economic circumstances of those at Lings Primary. With 55% of students receiving free school meals, a third involved in social services or child support programmes, and the school finding itself in the top 5% of the social deprivation index, it will come as no surprise to many that in 2010, Lings Primary was listed among the worst 250 schools in the country. Speaking with Leigh shortly after Easter in 2017, he describes the last six years as a journey of ‘building a community’. By building and running a ‘Creative-Connective’ curriculum, Lings Primary assembled a faculty that contained specialist teachers in creative subjects, and put creativity at the heart of learning. This approach affords students the opportunity to forge their own learning pathways as they develop the skills to think through problems. Many projects see the whole school working from the same source material, further strengthening the feeling of community between different year groups, and giving a soft introduction to the type of departmental setup typically found in the workplace. However, no educational experience – no matter how progressive or rooted in technology – would be complete without including the works of a certain William Shakespeare in some form or another! In fact, Lings Primary is aligned to the Royal Shakespeare Company. With an emphasis on creativity, and importance placed on performing arts such as music, dance and drama, there is plenty of scope to link different subjects and age groups together over the school year by basing projects on some of The Bard’s more recognised love stories, comedies, adventures and tragedies. So how did Minecraft find its way into the classroom, and what would you need to do? After attending MINECON in the summer of 2015, Leigh set about with MinecraftEdu on 30 machines. After great success here, he joined the beta group for Minecraft: Education Edition in 2016, and then in December of that year enlisted EasiPC to help with the further integration of the game-based learning tool within the school’s digital environment. Working more broadly across the NPAT, while all the schools function independently, they all belong to the same tenancy. These schools include Weston Favell, and Microsoft Showcase School Simon de Senlis Primary. 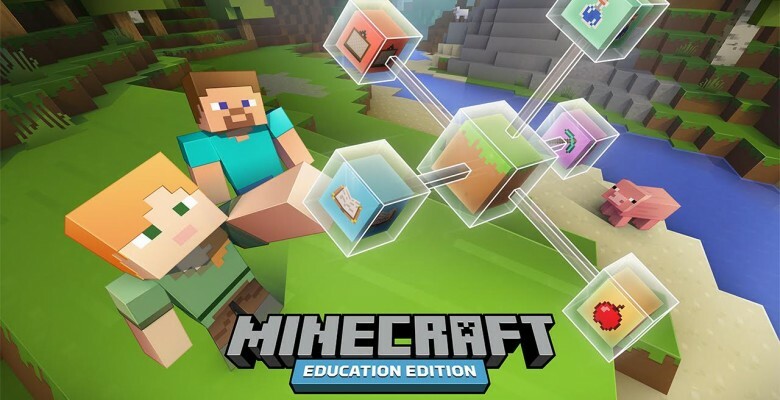 For larger scale deployments of Minecraft: Education Edition on new devices, all Paul and the EasiPC team had to do was go through the same easy process of purchasing the licences and applying them to the necessary Office 365 accounts. Bringing the focus back to Leigh’s comment about ‘build it, break it down, rebuild it’, this critical thinking approach is crucial when it comes to the successful use of technology, and the importance of being clear on your objectives. When it comes to the Shakespearian projects at Lings, the whole school will be working from the same source material, but different years will tackle different parts of the story. The current project is based on The Tempest, and for some students that will involve ‘analogue’ activities such as dance, music, or creative writing, but for others that creativity is channelled through technology. For instance, one class has been challenged to use Minecraft to build the island setting where the play takes place, based upon their interpretation of the characters’ descriptions throughout the script, and furthering and understanding of anther curriculum subject – geography. This entry was posted in Banner, Blog. Bookmark the permalink.